Yesterday I reported on, among other things, the focus shift using manual focusing of the Fuji 45 mm f/2.8 lens on the GFX-50S. This morning I came up with what seems to me to be a good way of showing the result of three possible manual focusing strategies using that lens. I’ll show it to you first, then explain it. 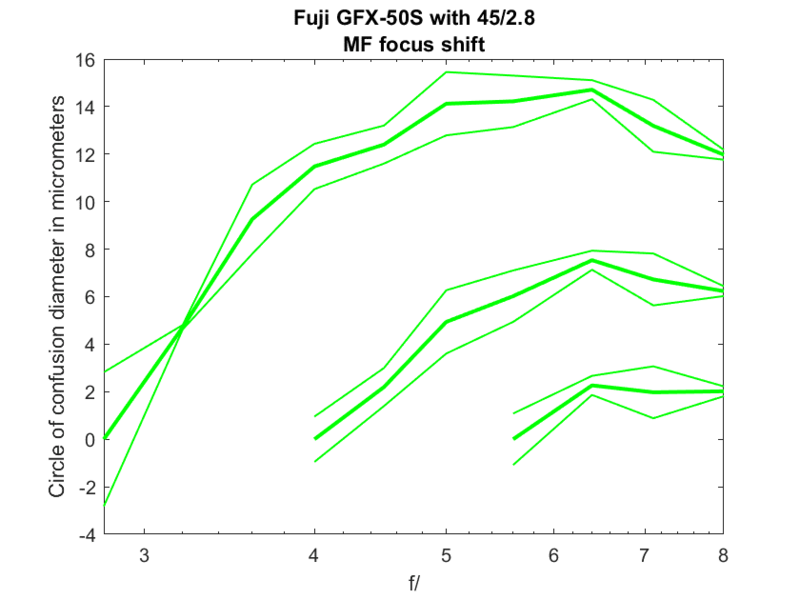 This shows the size of the green channel circles of confusion (CoCs) at various stops (the horizontal axis), when the lens is focused at f/2.8, f/4, and f/5.6. I haven’t plotted the CoCs that would result from using a stop wider than the stop used for focusing — that would be a crazy strategy. The worst-case focus error blur circle for wide open has CoC diameters between 2 and 3 pixel pitches. If you focus at f/4, the worst-case diameter is about one pixel pitch, and if you focus at f/5.6, less than half that. I think I’ll be using similar plots in future lens tests. So would you please explain a little more? I have 45mm and find it as focus shift.For critical work what sould i do?Never use af use mf? At MF mode lets say i will shoot at f8.What i do is stop the lens down with the dof preview button and focus manually at f8.So do you think this is a right way?Or sould i stop down at f4 and focus f4 and then turn the aperture dial to f8? Please let me know a bit without graphics but with your explanation. To be safe, I’d stop down to f/5.6, focus, and then stop down to f/8. So it is better to get rid of 45mm and buy 63mm maybe? I wouldn’t say that at all. The 45 is a perfectly fine lens.